Please add your colour selections below. You can choose up to 5. We can discuss shade/tint details in conversations. Thanks! Paper Flowers are a beautiful way to add spice to your home decor, liven up your baby nursery or add a touch of colour to your wedding and events. 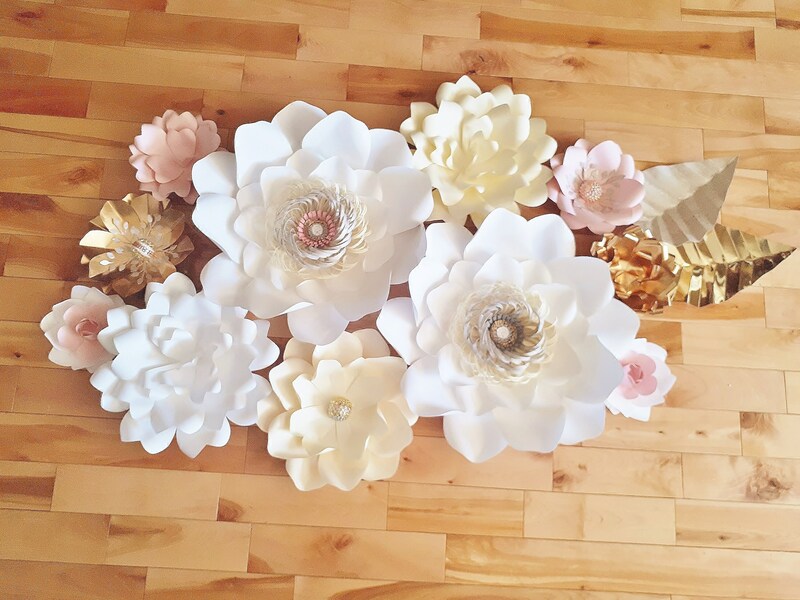 This set of 10 paper flowers is perfect as a flower wall in your baby nursery, as a paper flower backdrop accent for your wedding, as paper flower decor for your home and so much more. Flowers come completed (no assembly required). Offering a varied look with flowers ranging in sizes of 5 inches to 20 inches with jewel and/or paper centres. Just perfect for my granddaughters nursery. They arrived pristine and ready to hang. We have had many complements on how great they look in the nursery. The flowers are absolutely beautiful and the detail put into each flower just makes them even more amazing! Incredibly easy to hang on the wall with command strips. They helped to create the perfect accent wall in our daughters bedroom!